For decades, the mysterious figure known as the Jonin trained and tutored the agents of MI6's Ninja Programme. In his hands, the men and women of Britain's most elite secret service were refined into more than spies... They became human weapons capable of inflicting extraordinary damage and defying the laws of nature itself. Now, after decades thought dead, this master killer has resurfaced...and recruited a new circle of undying, seemingly ageless powerhouses from across the Valiant Universe for reasons unknown. 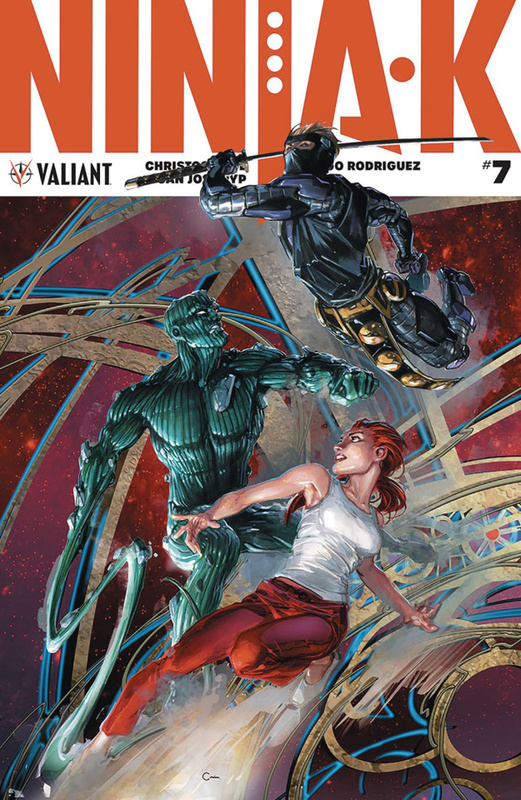 The Jonin's revenge will cast a long shadow - and, to meet it head on, Ninjak has assembled his own squadron of heavy-hitting heroes - including Livewire, Dr. Mirage, Punk Mambo, and GIN-GR - for the ultimate black-ops mission! Renowned writer Christos Gage (Netflix's Daredevil) and incendiary artist Juan José Ryp (BRITANNIA) unleash the next chapter in an international super-spy thriller colliding Valiant's newest superteams together in an untold show of force!